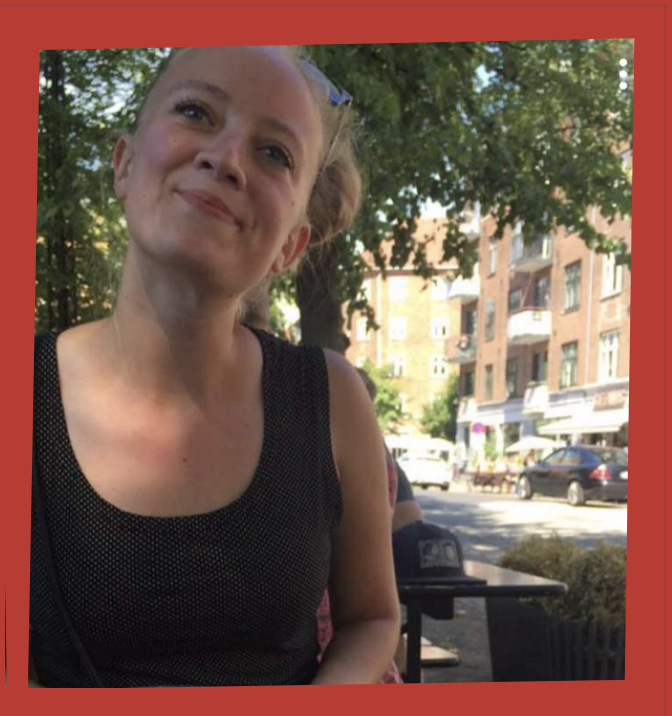 My name is Naomi de Graaf, I am a 22 year old Occupational Therapy student at the University of Arnhem and Nijmegen (HAN) in the Netherlands. This year I started my fourth (last) year of education. It consists of a half year thesis (first semester) and a half year internship (second semester). Now I am doing an internship in a hospital in the Netherlands, but before that I did a thesis in Bali for 3 months. I am very excited to share my experiences with you! I was there from October 2nd till January 15th, 2018/2019. Bali is a small island in Indonesia, South East Asia. Compared to other islands of Indonesia, Bali is already the most westernized. My stay was the Indonesian concept of luxury, I had my own studio with shared pool. Through a teacher from my university I had a contact person in Bali, who helped to find shelter, visa and so on. I quickly felt at home in Bali because of the incredibly friendly people, the free and relaxed life, warm weather and the beautiful nature. When I returned to the Netherlands, I had more problems with a culture shock, because of everything that must be done quickly in Europe and the high expectations. In Bali traffic is very busy, they drive on the left and there are many scooters. I had to ride scooter in Bali- At the beginning I found this very scary, but at the end I managed to drive through all the traffic and I loved it! 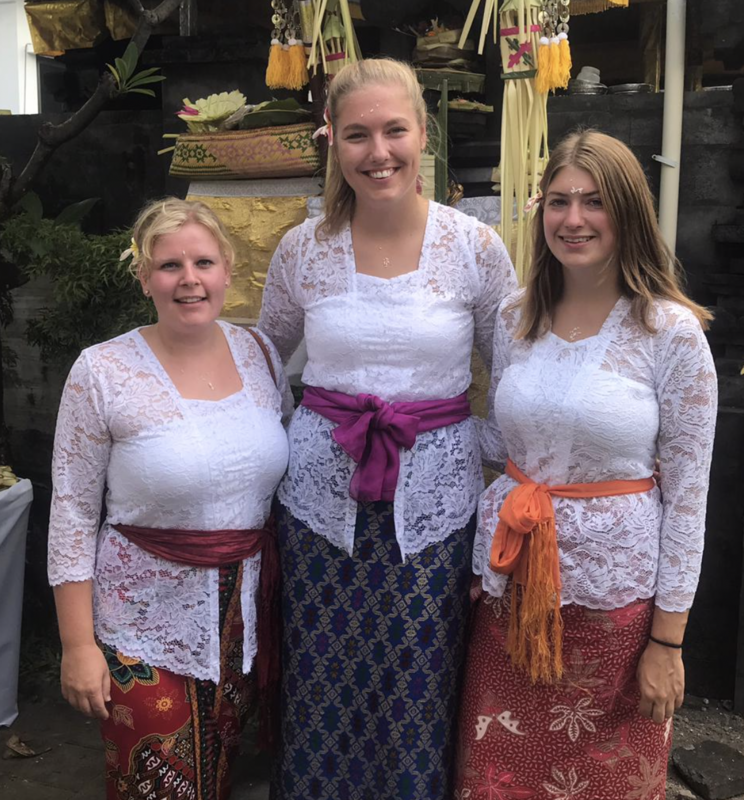 I did research in Bali together with two other Occupational Therapy students and two Physiotherapy students in a hospital setting. In Bali, they didn’t promote the importance of rehabilitation and exercise after stroke to its full potential. The project had been developing for two years and our part was to implement the already made leaflets with exercises for home rehabilitation. I have learned that it is very important to adapt to the culture. In addition, we as a group have learned to work more independently. I found the difference between a hospital in The Netherlands and Bali very interesting. The collaboration between the professionals was not always successful and they didn’t use guidelines effectively. Because of this I realised the importance of these behaviours. 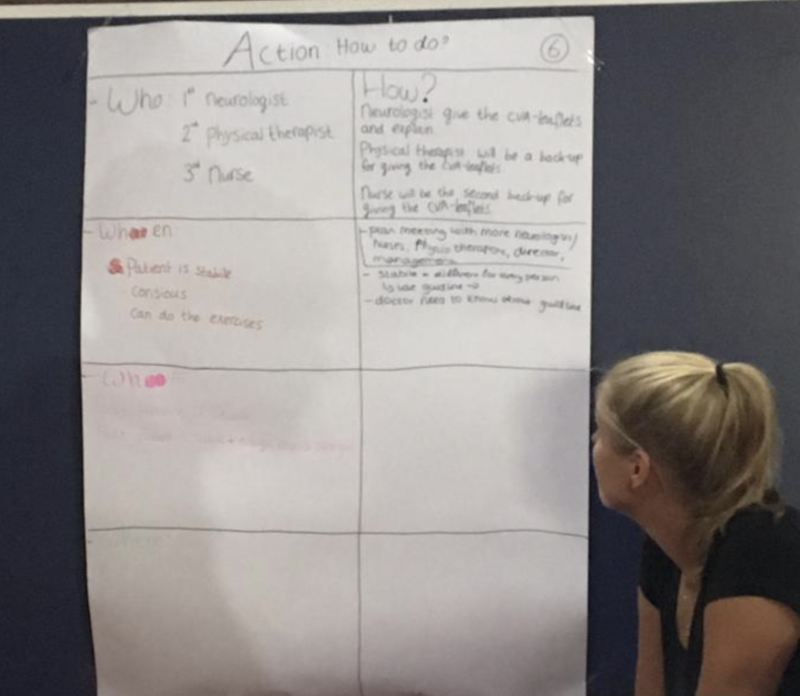 Working in a multidisciplinary group created a challenge; the Physiotherapy students preferred different work methods than the Occupational Therapy students. I have learned to share my opinion and have the confidence to know when to adapt myself or not. I would recommend everyone to do your thesis abroad or in a multidisciplinary group, because you learn a lot personally and professionally! 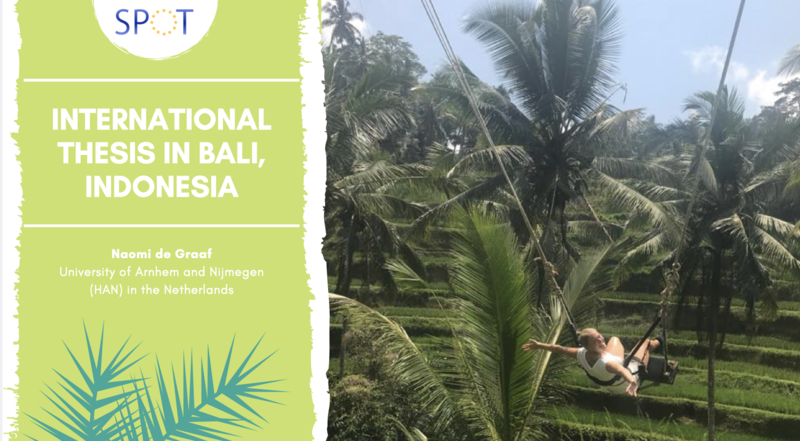 Occupational Therapy isn’t as widely established in Bali as in The Netherlands, but it doesn’t matter! You can learn a lot, because we had to promote our profession and transfer our knowledge from Europe. By sharing your knowledge, you learn again. I hope you enjoyed my experiences! 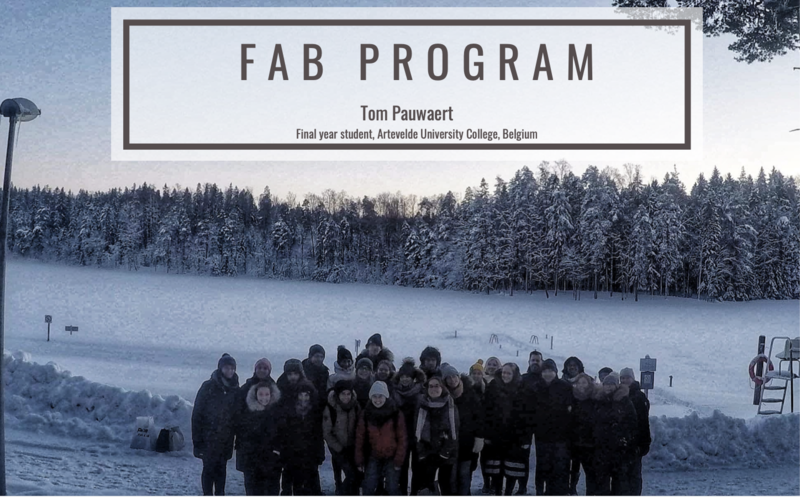 Hello, I’m Tom Pauwaert from Belgium and I’m in my final year studying OT and got the opportunity to join the FAB program. So what is the FAB program? The FAB project is a very unique project because it’s the only joint degree at bachelor level in Europe. 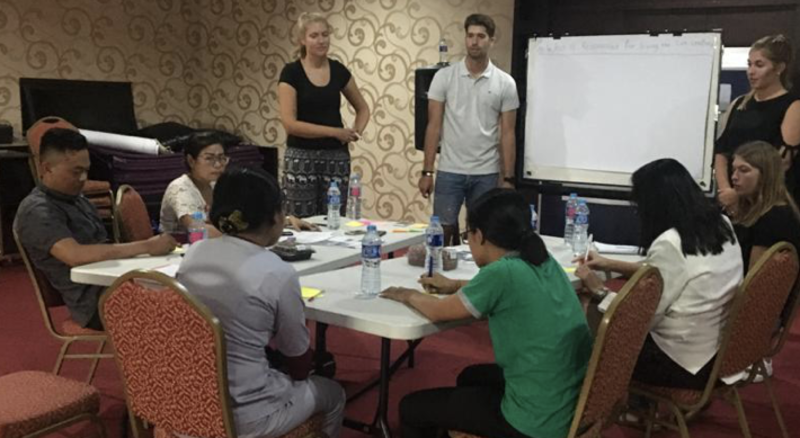 It’s a joint program in the last semester of your study as an OT with approximately 20 students in total and 12 teachers from Metropolia University in Finland, FH Campus Wien in Austria and Artevelde University College in Ghent. It consists of 6 modules. The first one was in Belgium in December, where we went on an urban exploration and got divided into groups of 5 to explore a district in Ghent. In this exploration we talked to a lot of people from different nationalities and asked about their occupation. On Friday every group gave a presentation about their district in a creative way. -Occupation consciousness of the districts. In February there was a week in Helsinki, Finland. There, the theme of the week was module 2: “the future of OT by 2030”. There were really broad themes such as technology, internationalization, demographic changes and participation for working life. The brainstorming sessions were about where and what OT’s will do in the future. It was fascinating to see the different perspectives from every group. Each group presented what the emerging roles might be in the future. 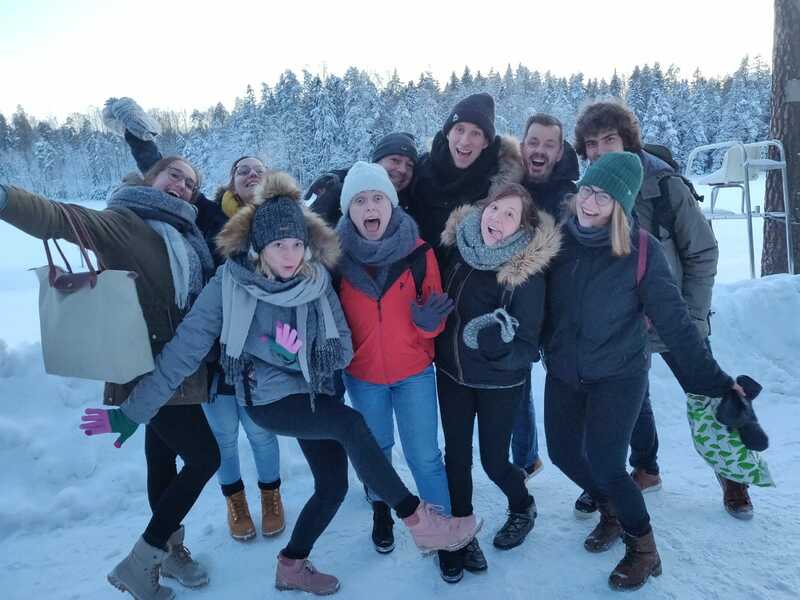 After the week in Helsinki all the students are doing an internship abroad for 12 weeks in module 3. In my case, I’m currently doing an internship in neurology in the Donauspital in Vienna. All the students are doing module 4: Health Promotion at the university that is responsible for them during the internship. There we are working in small groups about health prevention and health promotion. During you’re internship you get time to write your bachelor thesis, that’s the 5th module. In June we will have the final week module 6 of the FAB project in Vienna. Here we will go further into urban exploration, building up on the knowledge we achieved in Belgium. What was your overall experience of the program? In my case, this project has been an outstanding experience so far. This cooperation is beneficial for your personal development as an OT but also learning about the cultural differences between the countries and in fields which OT’s work. In little groups during the week you get to know everybody from the FAB project really good and we’re becoming one big family. This project will grow in the future and I would recommend it! It has shown me that during this week you get motivated by the teamwork. After every week I come home inspired and ready to go further in my development as an OT! Greetings world from wintery Denmark! 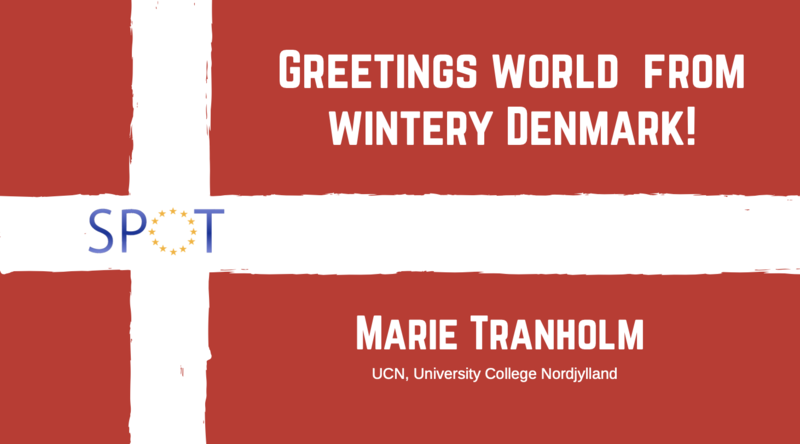 My name is Marie, I am a 26-year-old OT student and I’ve just started my 5thsemester (out of seven, they are 6 months each) of my education at UCN, University College Nordjylland. 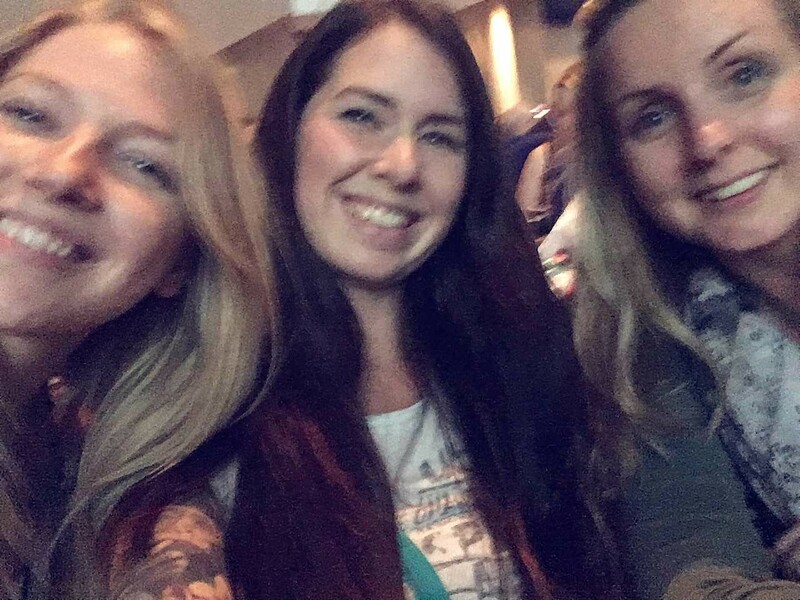 I have been a part of SPOTEurope for about a year now or at least since last years COHEHRE conference in Belgium where I met sweet Marlies, who introduced me to the SPOT world. For the moment I am very busy with our exams plus starting an internship and so forth. Student life, you know? But I am currently working on starting a MINI spot at my university. I have spoken to some other universities in Denmark and we are all very keen on starting the project. 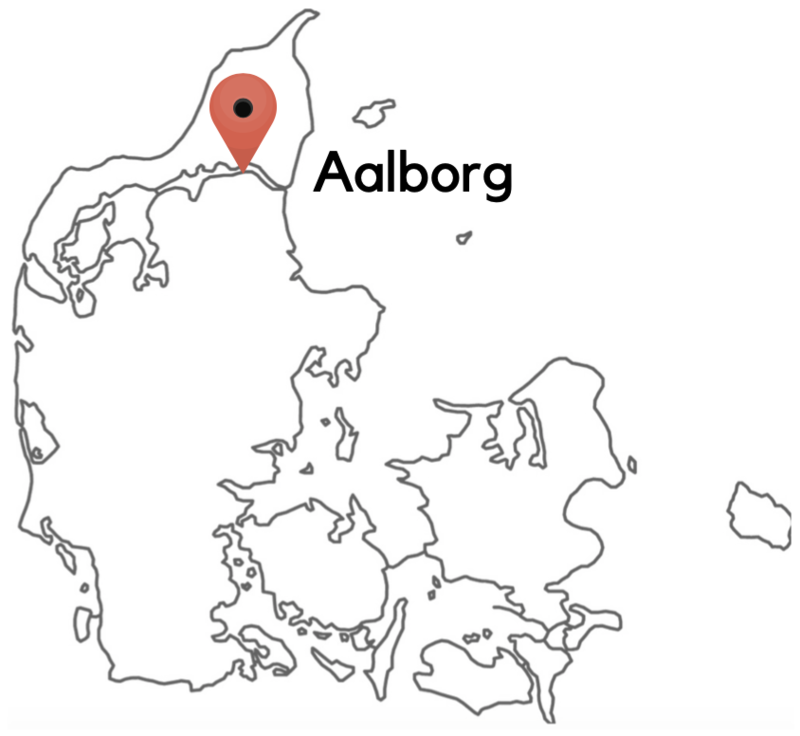 It is still an ongoing project and we are only in the beginning phase, but I have no doubt that the MINI spot will happen very soon in Denmark. But Rome wasn’t built in one day (as far as I know)! In the end of last year, I also attended an international project called GO4EOT with students from Belgium, Sweden and Austria – I was the only Dane. We all met on Skype and discussed different target groups in our countries and how they were deprived of occupation. We were then divided into groups where we chose a specific area to work with- my group chose inmates, who are about to be released from prison. We did a lot of work researching, talking to people who work with our target group and so on. All in all, a very exciting and fun project. Plus, we had a lot of fun in my group even though we could not see each other face to face since everything was done via Skype! 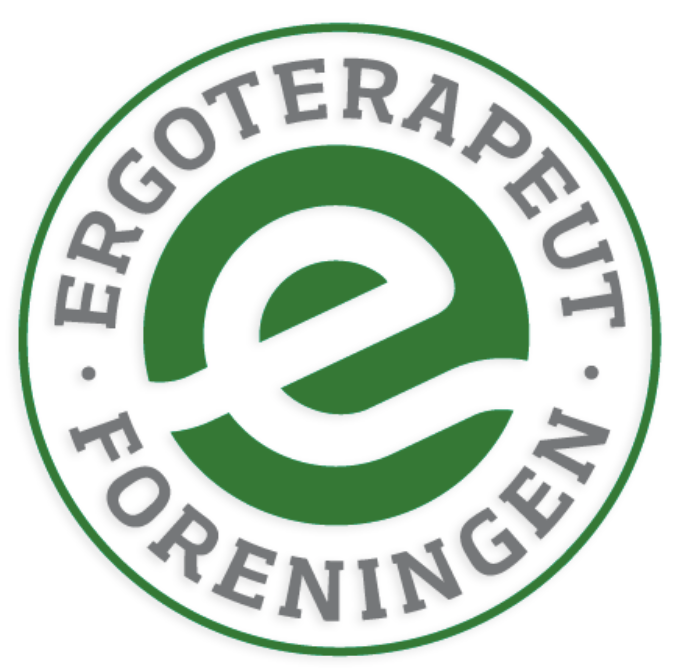 Lastly, I am pleased to share that the national OT association in Denmark, Ergoterapeutforeningen has reached out to me. They are doing an interview with me where, I amongst other things, talk about SPOTEurope. The association has a magazine that comes out every month and the next issue is about international collaboration and so they contacted me. It’s very exciting to promote my international interests and SPOTEurope! Hopefully it can encourage more students to travel internationally. AND make more people aware of SPOTEurope and what we do. 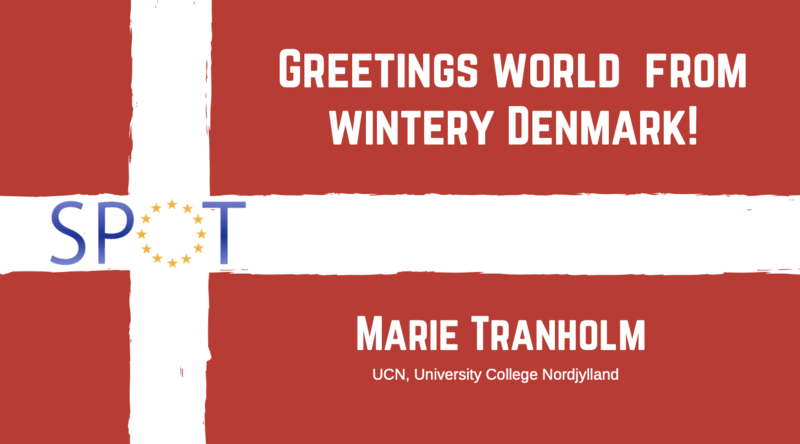 Besides that, I am about to become the Danish student representative for the OT association, and I will definitely make sure that SPOTEurope is heard and promoted! That is all for now! Hope everybody is doing great! On Sunday March, 18th I took part in a workshop with 16 others French OT students, to learn and start to develop an awareness project about difference. This was one of the many workshops who happened during the 12th WEF of UNAEE, a training meeting of 2 days for OT students, who takes place every year in one of the 24 OT Schools in France. This workshop was held by Marie, UNAEE’s board member, William, president of Sibsters, and Camille who’s also from Sibsters. If you don’t know UNAEE yet, you can have a look at this former article on the blog. About Sibsters, it’s a young French association, created by William and a friend of his 2 years ago. Sibsters aims to promote and inform about differences, as today many people are left out of society because of their disabilities, origins, sexual orientation, gender, appearance, etc. Thus Sibsters organises events and uses the hashtag #LaDifferenceInspire that means #DifferenceInspires to promote and communicate about difference. In this article, I’m going to recap methods we used and ideas we had during this workshop, hopefully it will inspire you to develop projects! William, with the help of others OT students, identified a specific theme which was LSF, French Sign Language. The main goal of our projects was to raise awareness about French Sign Language and the need of having basis about it, to foster inclusion of hearing-impaired and deaf population in society. Choose a theme you care about, identify a need in society. As OT students you are aware of inclusion issues curtain population face of in society, then you can help their voice to be heard. William, Marie and Camille then suggested 3 types of projects to us: a video, a happening and an event. My team and I choose video! You can do whatever you want: a flyer, a congress, a pop-up in shopping centre, a humanitarian mission, etc. Be creative! Third step… go for it! Here’s the method we used to pilot our project development: the Five W’s. These are questions whose answers are considered basic in problem solving. Who’s involved or will be involved in? Who does our project target? Who’s going to implement the project? What do we need to develop and implement our project? Which means will we use to reach our goals? It’s also about temporal organization of project stages, creating a timeline is helpful. Where the team will meet/communicate? Where can we find resources? It’s important to wonder WHY before taking any decision! Why this option rather than another one? And we added a sixth question HOW? to the list. How are we going to manage each stage? In just an hour, we managed to have many rich and concrete ideas! When the whole team brings its creativity it’s much simpler than it seems, then just go for it! 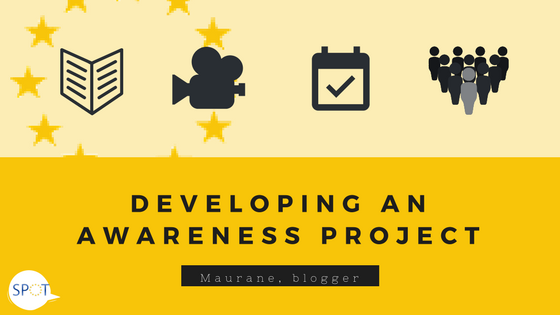 Hopefully this article inspire you to use your OT student and personal skills to develop an amazing awareness project, looking forward hearing your feedback and your experiences! Volunteering as an Occupational Therapy Student: My first experience using my OT skills alone in the big, bad world! 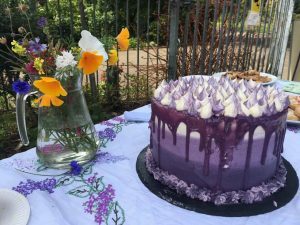 Published by Charlotte (site admin) on behalf of Author Orla. Hello, my name is Orla, I am Irish, and studying occupational therapy at Teesside University in the North of England. 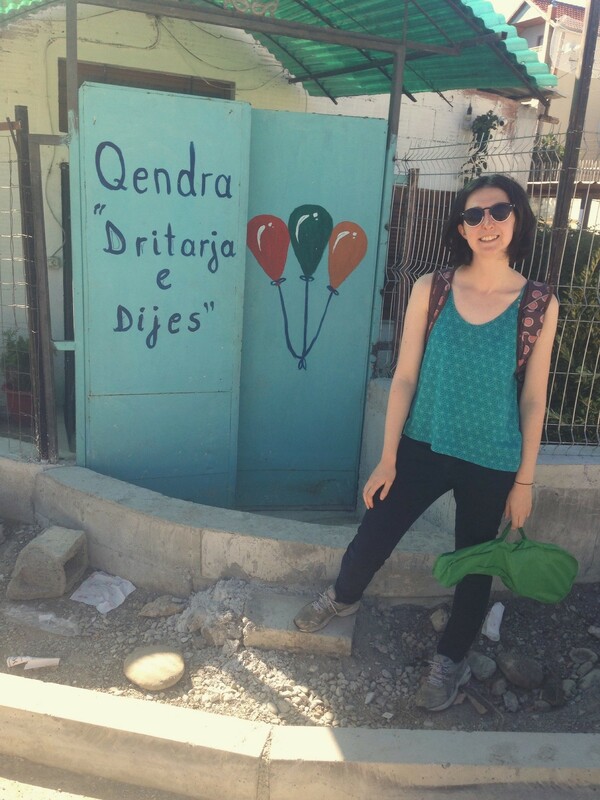 After hundreds of Google searches, I decided upon a centre for marginalised children run by the charity Caritas on the outskirts of Albania’s capital city, Tirana. I volunteered here for 2 weeks in September 2017. The community was made up of minority groups such as Roma and Egyptian families who had moved closer to the capital in search of better opportunities. I was not expecting the levels of poverty I saw. The children lived in slums by a river that flooded every winter and they had no running water or the basics that I expected. ‘I am in a European country after all,’ I thought wrongly. The main aims of the centre were to give 5-18 years olds in the area the chance to gain an education, learn life skills, eat nutritious meals, and partake in sports and fun activities. The 8 members of staff included social workers, a teacher, and a doctor. What were your expectations before volunteering? I was excited to observe and work along the long-term staff that have deep roots in the community and use my occupational therapy knowledge to support them when appropriate. I made sure to humble myself before beginning this project, being mindful that I was not going to ‘fix their problems’ in 2 weeks but instead encourage and assist long-term staff to continue to make a difference in the lives of these families. My biggest difficulty was the language barrier as I don’t speak Albanian. Two members of staff were able to translate but activities often got lost in translation and a new game may have formed before I even finished my explanation; the Albanian version of my activity! My personal favourite was conducting the Kawa river model with the teenage group, my poor translators! In my past volunteering roles, activities had one purpose: to have fun. This time, I was looking through my new OT lens and began to shape these fun activities to have SMART objectives in line with the centre’s overall purpose. This meant facilitating activities that had specific, measurable, achievable, realistic, and timely goals. In practice, this was an optimistic ask as Albania has a more relaxed culture when it comes to timely goals. But they found it useful that the games had the purpose of developing positive skills and qualities. I focused on their interpersonal skills including communication, turn-taking, and team-work. A highlight was teaching the children the self-care occupation of brushing their teeth as I discovered none of them owned a toothbrush and toothpaste. I organised a donation from Ireland to purchase one set for each child and for the centre’s doctor to give a presentation on the importance of dental hygiene. I admired how the centre looked out for the children in every aspect of their lives. For example, they adapted how they taught self-care occupations to how the children would carry them out at home, like using a cup of water to brush their teeth instead of a tap. Also, they realised that there was no point teaching self-care tasks if the parents were not also promoting them at home. Parent meetings were therefore set up, resulting in some great solutions to community issues such as litter picking groups. I loved seeing people that would never come together naturally in the same room making decisions to better their community. This approach was broadened to all areas of the children’s lives. The social workers made sure the children weren’t treated differently at mainstream school (One day at the school gates, the Roma children were told by their teacher there was no space for them but the social worker fought their case) and were consistently meeting with the local government to try to organise running water and rubbish collection to the area. I am hopeful that when projects like this take a holistic approach to their population, poverty cycles can be broken. What are your plans to keep in touch with this project? Thanks for reading! What has your experience volunteering as an OT student, at home and abroad, been like? Feel free to ask me a question about this project (or just say hi) on SPOTs forum or on Twitter (@orlatheot). UNAEE is the French occupational therapy student national association. It has been created in 2006 to answer an important representation need. UNAEE main goals are to defend OT student rights and interests, to represent them within decisive structures and to assist them for the best quality of studies. UNAEE is independent and not affiliated to any political movement nor religion. 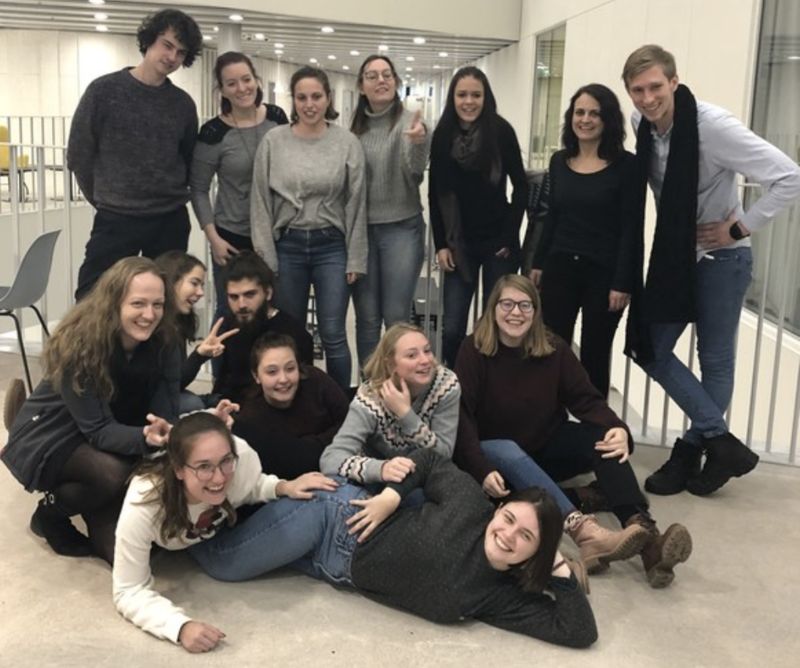 UNAEE federates and gathers every local association from every institute in France and is the only representative association for French OT student on national scale. UNAEE is composed by 24 local associations. As a matter of fact every 2 542 OT student in France is member of UNAEE, benefits from its work and can contribute to its actions in various ways. Each year, projects and events are led by a new national crew while politic is discussed with every local association through their administrator. UNAEE initiates projects in the fields of representation, quality of life improvements, knowledge, studies, culture, citizenship, prevention, solidarity, international mobility and much more! UNAEE works with a lot of other associations in order to promote OT, accessibility and destigmatize disabilities. We’re willing to get to know more European OT students and share with them about our mutual wonderful profession. You can get news from us on Facebook or on our website. Feel free to contact us on SPOT’s forum or at vp-international@unaee.org too! Comradely, Posted by Charlotte Walker on behalf of author Guilhem Montalbano. “Sense-Aware.” Student Occupational Therapists Start Community Project! Hello, we are two second year Occupational Therapy students at Plymouth University in the South-West of England. After attending the Royal College of Occupational Therapy conference in June, we were inspired to bring our learning to our local community in a creative way. This led to the development of our project ‘Sense-Aware’! We both have experience with supporting people with Autism and associated mental health conditions. 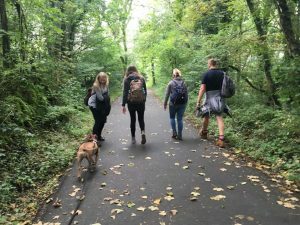 Currently, we enable young people to attend ‘Rooted’ – a group run by Routeways who are a local Plymouth charity supporting children, young people and their families to overcome disadvantage. ‘Rooted’ facilitates young people’s engagement in outdoor activities, gardening, baking and crafts whilst teaching them social skills and offering them emotional support. Through attending the group with service users, we recognised that the premises did not have somewhere for young people to spend time when they felt overwhelmed or needed space. In line with Routeways current focus to make the group accessible for young people with Autism, we drew inspiration from a session at the conference on sensory-circuits; and decided to create the project ‘Sense-Aware’ to build this space. The aim of the ‘Sense-Aware’ project was to research and fundraise for a range of sensory equipment, to educate others about the importance of supporting and managing an individual’s sensory needs within this population. The final aim was to set up a sensory room within the already existing ‘Rooted’ group to benefit those with Autism and facilitate their engagement in a range of activities. After extensively researching, attending study days and meeting with professionals with first-hand experience in the field, we were able to ascertain a sense of direction for the project. This led us to the fun part – fundraising! 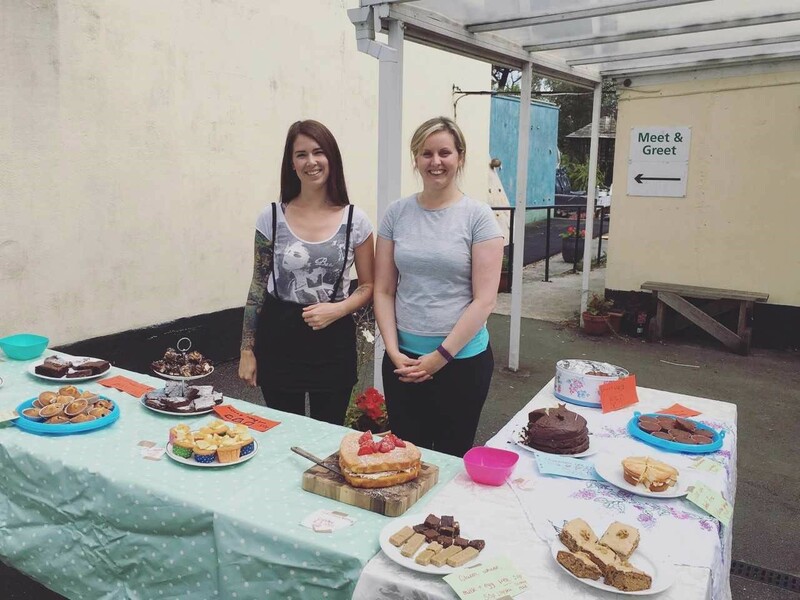 We created a gofundme page, got up super early for car boot sales, baked lots of cakes to sell at group and trekked across Dartmoor, which all totalled over £500!! With this, we have managed to purchase lots of equipment and toys, but has also allowed us to create the possibility of staff, carer and parent training within sensory based intervention. We have also recruited a regular volunteer, Alannah, who will provide 1:1 support for service users who would benefit from having that support in a group setting. Currently in the pipeline is the possibility of collaborating with a Paediatric Occupational Therapist to provide cost-effective assessments for sensory requirements, and provide clinical supervision for our team. From our experience, we would like to encourage other students to act on their interests and not be discouraged by their level of study. This project has given us insight into our future career and provided endless opportunities. We are massively grateful for everyone who has supported us through this adventure. We would like to pass special thanks to Sam Turner, our lecturer and mentor throughout this process. Hop over to our forum or social media pages to chat or ask questions about the Sense-Aware project, or to tell us about your own project. Do you like to work in an international context? Do you want to enrich your CV? Broaden your (international) network? SPOTeurope is a community with members from all over Europe in which we exchange knowledge and practices about the OTworld. It’s a community by students for students. 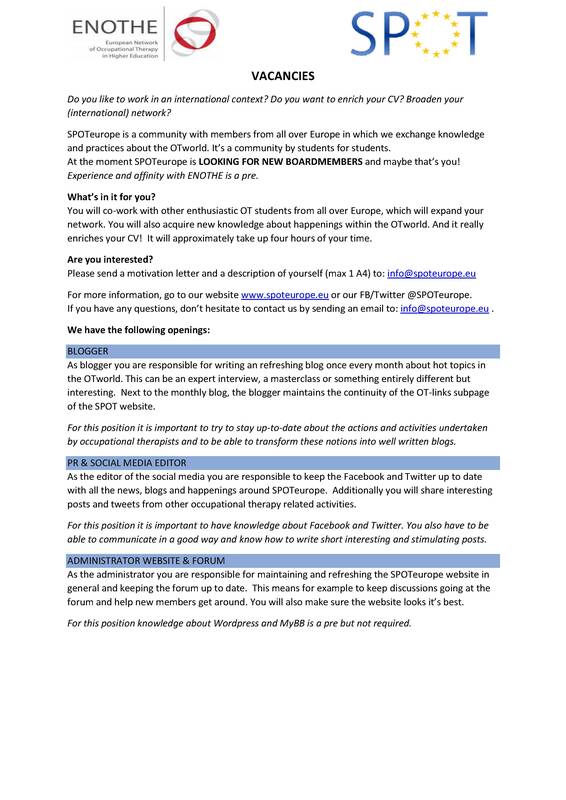 At the moment SPOTeurope is LOOKING FOR NEW BOARDMEMBERS and maybe that’s you! Experience and affinity with ENOTHE is a pre. 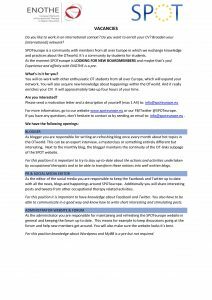 You will co-work with other enthusiastic OT students from all over Europe, which will expand your network. You will also acquire new knowledge about happenings within the OTworld. And it really enriches your CV! It will approximately take up four hours of your time. For more information, go to our website www.spoteurope.eu or our FB/Twitter @SPOTeurope. If you have any questions, don’t hesitate to contact us by sending an email to: info@spoteurope.eu . As blogger you are responsible for writing an refreshing blog once every month about hot topics in the OTworld. This can be an expert interview, a masterclass or something entirely different but interesting. Next to the monthly blog, the blogger maintains the continuity of the OT-links subpage of the SPOT website. For this position it is important to try to stay up-to-date about the actions and activities undertaken by occupational therapists and to be able to transform these notions into well written blogs. As the editor of the social media you are responsible to keep the Facebook and Twitter up to date with all the news, blogs and happenings around SPOTeurope. Additionally you will share interesting posts and tweets from other occupational therapy related activities. For this position it is important to have knowledge about Facebook and Twitter. You also have to be able to communicate in a good way and know how to write short interesting and stimulating posts. As the administrator you are responsible for maintaining and refreshing the SPOTeurope website in general and keeping the forum up to date. This means for example to keep discussions going at the forum and help new members get around. You will also make sure the website looks it’s best. For this position knowledge about WordPress and MyBB is a pre but not required. We are two occupational therapy students who are curious about prewriting skills of children in other countries and how other OT-students become acquainted with these during their education. In this blog we write about a Dutch assessment which we were introduced to when we had to screen the prewriting skills of children. We will also share our experiences of this assessment with you. Finally we have some statements we would like to discuss about. We like to write a blog about a Dutch assessment the KOEK. The KOEK is an assessment developed by Hartingsveldt van MJ, Cup EHC, Corstens-Mignot MAAMG (2006). The name KOEK stays for ‘The Short Observation Occupation Toddles’ and is developed for children in pre-school. The English version of the Koek is the SPOT (Screening Prewriting Skills Occupational Therapy) The spot has been developed for: 5 and 6 year old children with mild fine motor problems or 5 and 6 year old children showing even milder problems or children that could not be diagnosed with DCD. The SPOT aims in offering a guideline for observing fine motor skills in preschoolers. The SPOT is a tool for observation with the emphasis on quality of the performance. It has been developed to be used by occupational therapists to assess whether a preschooler has reached an acceptable level of writing readiness. The SPOT can be used to evaluate fine motor problems in preschoolers as well ( Hartingsveldt, 2006). For the SPOT is no special training needed but a profound study of the manual is necessary. The assessment can be done in 30 minutes. Following a question on the forum, a discussion has arisen regarding the Children Of Parents with a Mental Illness (COPMI) Australian initiative. For those of you who are unaware of this, please find below a link to the COPMI website and some journal article titles regarding COPMI to get you started. We would be keen to hear your experiences of how your country works with clients in this situation? – Do you involve children of parents with mental illness in your therapy/ intervention? – If so, how do you do this? Do you use specific assessment techniques or interventions? We look forward to hearing your responses!